There is nothing quite like a falling dollar to spur talk of the erosion of the greenback's reserve status. There has been talk for several months that China is preparing in yuan-denominated oil contract (with an embedded gold option). It has not been launched yet, but some observers see it as a blow to the dollar's role. We are skeptical. In the mid-1970s, when OPEC agreed to use the dollar as the benchmark for setting prices, it may have been significant. However, we argue that the liberalization of the capital markets has changed this assessment. The key to the dollar's reserve role is not that most commodities are priced in dollars or that trade, even when the US is not a party, is often conducted in US dollars. The key is the deep and liquid bond market. For various reasons, countries have chosen to build reserves. Frequently, the reserve accumulation is a consequence of a country's currency and trade policies. Since the 1997-1998 Asian Financial Crisis, some countries may have chosen to build reserves as a type of self-insurance to avoid having to go to the IMF. Also as trade flows and capital flows increase, some countries built their reserves. Following the decision to hold or build reserves, the question arises as to what currencies to hold. Actually, it is not so much which currencies to hold, as there is a handful of currencies that are recognized by the IMF. It is a more a question of allocation. After a certain level, the more reserves a country has the fewer choices it has. Reserves are highly concentrated in dollars and euros, which together account for nearly 85% of global reserves (whose allocation has been reported). The ownership of reserves is also concentrated. Two countries, for example, China and Japan, account for nearly 40% of the $11.3 trillion value of global reserves (as of the end of September 2017, the latest authoritative IMF data). While many central banks keep some reserve liquid, the bulk of the reserves are invested in interest bearing securities and a market. If a country has a few hundred billion dollars or less in reserves, there is plenty of ways to achieve diversification. If one has accumulated a trillion dollars or reserves like Japan, or more than three trillion like China, the ability to diversify is more constrained. China may feel somewhat trapped because the US Treasury market is the only market large enough to absorb its massive reserves. However, the trap is really in accumulating so many reserves in the first place. Yesterday, the Bundesbank, quickly followed by the central bank of France, acknowledged that they had purchased yuan for reserves. The market seemed surprised and seemingly used it as an excuse to sell dollars. There was no need for surprise. 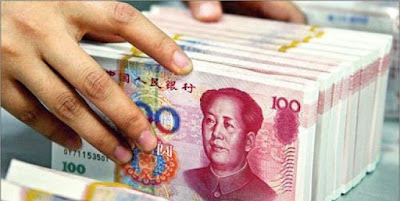 The ECB announced in the middle of last year that it had bought about 500 mln euros of yuan for reserves. Once the ECB bought some yuan for reserves, it followed that some of the national central banks would do the same. The Bundesbank admitted it was following the ECB. It also noted that other national central banks in the Eurosystem had also bought yuan. Moreover, once the yuan was included in the SDR, it seems to change the issue at hand from including yuan to how much yuan to hold. The dollar value of the yuan in reserves as of the end of last September was $107.94 bln from $99.65 bln at the end of Q2 17. At the end of 2016, when the IMF first broke out the yuan reserves, it estimated them at $90.78 bln. The yuan accounted for a little more than 1% of global reserves whose allocation has been declared, and some of the dollar's value of yuan reserves is a function of the yuan's 4.2% appreciation against the dollar in the first three quarters of 2017. China's yuan's share of reserves is smaller than the Australian dollar and Canadian dollar (1.8% and 2.0% respectively). The largest reserve holder in the world, China, cannot put its own currency in its reserves. While some observers get excited bout the demise of the dollar and rise of the yuan, Chinese officials themselves seem considerably more circumspect. The Deputy Governor of the PBOC, Yin Yang, was quoted acknowledging that it will take a long time for the Chinese yuan to be a major reserve currency. China takes a strategic view. China's role in the world economy is larger than its role as a reserve asset. But this is not unique to China. Germany is the the world's fourth largest economy and the world's largest exporter, but the the euro's share of reserves are less than 1/3 of the dollar's share. Or consider that Japan is the world's third largest economy and yen reserves account for near 4.5% of global reserves, just ahead of sterling's share. Some observers complain that the dollar's share is greater than the US role in the world economy. While that may be the case, there are many countries that tie their currency to the dollar and the dollar's share of reserves is more in line with this dollar-bloc, of which China has not completely broken with, according to many.